Swiggy, India's famous food order and delivery app is serving in more than 100 cities of the country. This online food ordering system is building the network between the restaurants and customers so that the delivery of fresh and tasty desserts and food can be done on time. At present, this restaurant food delivery app is charging approx 15-40 percent from the vendors as a commission rate and at customer side, it is around 20-50 rupees per order as a delivery charge but it varies according to the city. By implementing such commission and delivery charge policy for online food ordering services, Swiggy is earning a sound revenue which has made it an outstanding, remarkable and unicorn tag company. With the same hope, a number of food startups are entering in this market but due to some food delivery business failures, a few having a potential to survive. Today, every entrepreneur is using the on demand apps like Swiggy to deliver a meal at the doorstep of the customers. Apart from real-time dispatching, they can also track the sales, customer purchasing behavior, favorite foods, wishlist, and other essentials using the best online food delivery app. According to the recent statistics report, India's local food delivery app market is burgeoning by the annual growth rate of 9.9%, which is making the revenue volume of US $10,363 Million by 2023. In 2019, it is expecting around the US $7,092 million using an online food app. After knowing this much potential, investors are ready to go with the white label app like Swiggy clone to target their existing customer base. 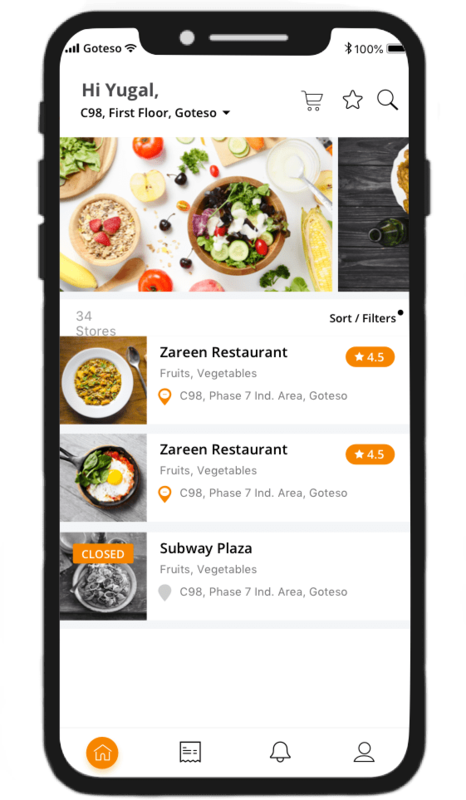 If you are also searching for the top mobile app development company to get a food ordering app for restaurants then you are in the right place. We empower the businesses with technology solution which assist them to clock a target revenue. Goteso is a food delivery app development company which mainly focus on client-centric approaches to get an expected ROI. For a custom food order application, you can send your inquiry at info@goteso.com or get in touch with us to know more about food delivery app development cost. Customers can make a quick order for the delicious food from their favorite restaurant. 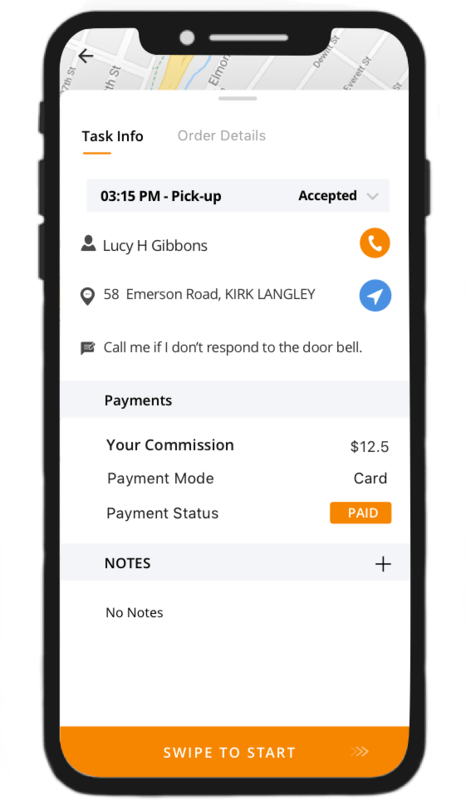 Customers can set a schedule for the pick-up and delivery as per their own convenience. At the time of late delivery, customers can track the exact location of a delivery agent to get the idea about the dispatching time. Customers can receive an offer, discount vouchers, and promotional coupons to get the benefit from the app via notifications. For making a payment of delivered food, customers can opt any payment mode from the various options like credit/debit cards, net banking, wallets (PayTm), LazyPay, Freecharge, Sodexo, CODs and other integrated gateways. Using the referral programs, the customer can share the app with their connections via integrated social media platforms. By rating and feedback panel, the customer can leave the comment and star rating on the app so that the owner can take appropriate action in the future. An agent can update the delivery status after getting the customer digital signature in the app. Using a profile option, the delivery agent can check his/her reviews given by the customer. They can also update the basic details like name, email, contact number, photo and other essential useful things in a delivery process. An agent can follow a short and reliable path while delivering the foods on the customer doorstep using integrated maps in the app. Using a partner app, vendors can easily upload new dishes and food items with their price in an app. Apart from this, they can also add the discount value with a certain product to generate more demand. A vendor can easily track the order and fleet status in the real-time dashboard or in partner app. A vendor can target potential customers by giving them offers, discounts for their favorite food and tasty dishes with the help of a notifications panel. With the help of partner app, a vendor can easily know the daily sales, expenses and other useful insights for business. A vendor can update the order availability status for a food item as per the stock or they can even set the food items according to the intervals like breakfast meals can be ordered only till 10:00 A.M.
An admin can easily add and update the vendor information like their address, owner name, contact number, commission rate, and other essentials for the business. Admin can also know about the most favorite restaurant in a city using the dashboard. An admin can view the customer information like their name, delivery address, contact, most favorable items, shopping behavior, and other useful details which are required. An admin can view all the fleets and orders in a single dashboard by scrolling the integrated map. They can also check the credibility of a delivery agent using this tracking feature. An admin can nimbly get the payments in their account using debit/credit cards, net banking, CODs, integrated wallets like PayTm and Mobikwik. 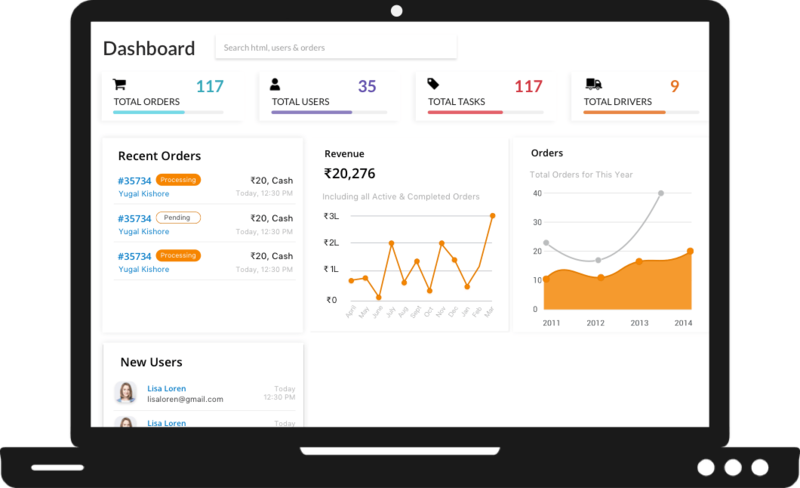 An admin can get graphical business insights like expenses, sales, and profit from a dashboard to make future decisions. Ready to start your Online Food Ordering & Delivery Business?